Early voting for the 2012 election does not begin until October 22 but, on September 27, 2012, it was the 2014 election that was on the minds of attendees at a Chicago Bar Association continuing legal education seminar, "Do You Want to Become a Circuit Court Judge?" The distinguished panel that spoke at this event event is shown above. 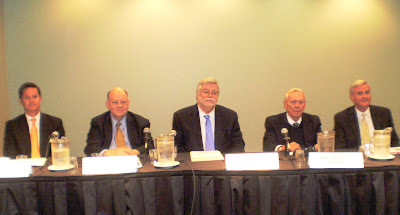 From left to right are Edward Austin, immediate past Chair of the CBA Judicial Evaluation Committee; Associate Judge Mathias W. Delort, a former election law attorney, who is about to take office as a Justice of the Illinois Appellate Court; attorney Daniel P. Madden, who serves as Cook County Clerk David Orr's designee on the Cook County Officers Electoral Board; Presiding Judge William D. Maddux of the Law Division of the Circuit Court of Cook County; and Associate Judge Thomas R. Mulroy, who also served as moderator of the program. Judge Maddux spoke about the qualities a judge should have, starting with Socrates' recipe for a good judge: "Four things belong to a judge: to hear courteously, to answer wisely, to consider soberly, and to decide impartially." Judge Maddux explained how these principles are enshrined in Illinois' Code of Judicial Conduct. In his remarks, Judge Maddux suggested that, of all the qualities identified by Socrates, impartiality is the most important and difficult. The craft of judging, Maddux said, is not visible; the judge's craft lies in the ability to separate from his or her biases, prejudices and preconceptions. Mr. Madden focused on the practical aspects of running for judge, the forms that must be completed, the deadlines that must be met, and the consequences of failing to do all that must be done properly. 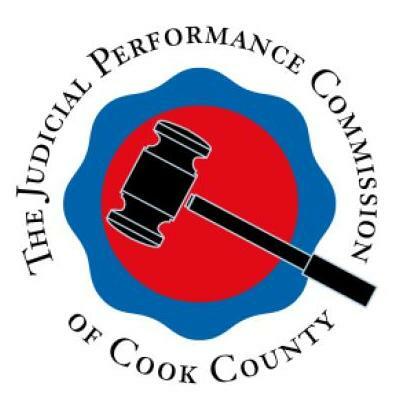 As Cook County Clerk David Orr's designee on the Cook County Officers Electoral Board, Madden sits in judgment when objections are raised to a candidate's nominating petitions. Madden explained some of the general rules governing judicial candidates, how a circuit court candidate can file for only one countywide and one subcircuit vacancy; when a candidate must choose which race to run in; how, under Goodman v. Ward, a subcircuit candidate must be a resident of the of the subcircuit at the time he or she files for that office. Madden mentioned that a person may be elected, but if he or she had not been entirely forthcoming about being a resident of the subcircuit, he or she can be removed from office when the true facts of residence surface. Madden went into detail about what must be contained in a candidate's nominating petitions and what must be filed with a candidate's nominating petitions (a notarized statement of candidacy, a receipt for the candidate's Statement of Economic Interest, and a loyalty oath -- although this last 'requirement' has been ruled invalid by Communist Party of Illinois v. Ogilvie, 357 F. Supp. 105 (N.D.Ill. 1972). And Madden pointed out that the actual Statement of Economic Interest is filed with the Secretary of State; it is only the receipt that is filed with the nominating papers. Filing the Statement with the election authority instead can be fatal to a person's candidacy. See, Kellogg v. Cook County Officers Electoral Board, 347 Ill.App.3d 666, 807 N.E.2d 1161 (1st Dist. 2004). 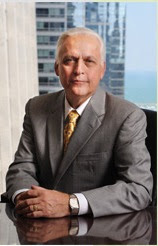 Delort explained the organization of the Cook County Democratic Party, the system of ward and township committeepersons, the import of making one's 2014 aspirations known to the Cook County Democratic Party offices by mid-summer of 2013. He explained that the Party's Candidate Outreach & Recruitment Committee, chaired by Cook County Board President (and 4th Ward Committeeperson) Toni Preckwinkle, will thereafter schedule brief interviews of persons who make their interest known. The full Central Committee will meet in October, and approximately half of the ward and township committeemen will sit on the committee that screens judges. Candidates will be invited to address this committee for brief presentations. Persons not already known to a significant number of committeepersons will most likely not be slated. Judge Delort also addressed the special ethical considerations that apply to judicial candidates: Though not judges, judicial candidates are bound by the Canons of Judicial Ethics. That precludes the candidate's direct involvement in fundraising -- counter-intuitive things, like not signing thank you notes to donors, for example. Judge Delort used his own recent successful primary campaign as an example, describing how his campaign established a system so that donations could be vetted to prevent any appearance of impropriety. Edward Austin spoke about the CBA judicial evaluation process. The CBA's forms are available online (click here), Austin noted. The judicial evaluation process is a searching inquiry into the totality of a candidate's career. The forms are lengthy and detailed and, when they are completed, a committee of nearly 200 volunteers, roughly divided in half between investigators and hearing panel members, goes to work. The investigators go first, contacting references listed. The CBA form (and the Alliance forms for that matter) require a candidate to disclose adversaries in recent matters. Most people (presumably) are civil toward their friends and neighbors, but how do they treat those who are adverse? The committee expects that there will be disgruntled persons in anyone's past, but by contacting as many people as possible -- and following up with disclosed contacts by asking these for additional people who might have information about the candidate -- the investigators can develop as accurate an assessment of the candidate's reputation as possible. The investigators' findings are presented to a hearing panel; this is where the candidate is invited in. Austin stressed that this is not intended as an adversarial or confrontational process. In fact, Austin said, the CBA does not want candidates to be 'surprised' by anything that is disclosed at a hearing. If the investigation has disclosed some particular area that the panel will want the candidate to address (a particular case, for example, or some financial issue) the panel chair will typically contact the candidate in advance to give the candidate a 'heads up.' The hearing panel will typically consist of between 12 to 18 members of the Judicial Evaluation Committee. All participants agree to keep matters disclosed at the hearing confidential. The panel makes a recommendation about the candidate after the hearing and the CBA rating will issue soon thereafter. The candidate is always the first to find out about the rating, Austin said. Judge Mulroy wrapped up the program with a presentation about becoming an associate judge. The associate judge selection process is an election, too, he said, but the electors are the full circuit judges. Seeking an associate judgeship can be a good fallback plan for a person who unsuccessfully runs for judicial office. There are 146 associate judges in Cook County, Mulroy noted, and, while this was not always the case in the past, associate judges now can look forward to possible posting to the most challenging and demanding assignments. Get to know the judges, Mulroy said. Become acquainted with your own and other committeepersons. Be active in your community. Know your subcircuit. Keep track of vacancies. Prepare for slating. Prepare for the evaluation process. If a person is interested in running for judge, form a committee to help raise money. Mulroy acknowledged that politicians sometimes attempt to assert influence in the associate judge selection process. But, he said, the judges who vote are more interested in what a candidate's skills and abilities are. The committeeman who can help an associate judge candidate is one who can address those concerns. One suggestion made, to varying extents, by each of the speakers was this: Seek out good counsel, knowledgeable in the arcane art and science of election law. (I am not an election lawyer.) When the leaves start to fall again next autumn, and the next round of candidates begin to circulate petitions, it will be far too late to start thinking about a run in 2014. As Judge Mulroy said, persons interested in a career on the bench should "begin preparing for this career change now."